Take advantage of our unique horse and carriage rental solutions and treat a loved one to a special gift on their birthday. 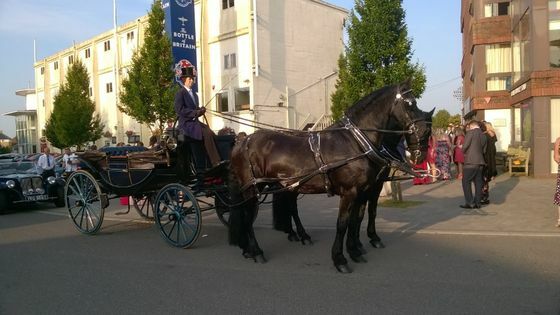 Here at Acorn Carriage Hire, Based in Faversham, Kent, we offer wonderful horse and carriage hire services, allowing you to spoil that special person in your life on their birthday. Even though we know children, parents, partners, and close friends well, it can still be difficult to find the perfect birthday present, especially if they don’t know what they want themselves. A birthday is an excuse for indulging your family members and friends and ensuring that they have a special and unforgettable day, what better thing to choose than a lavish horse and carriage ride? 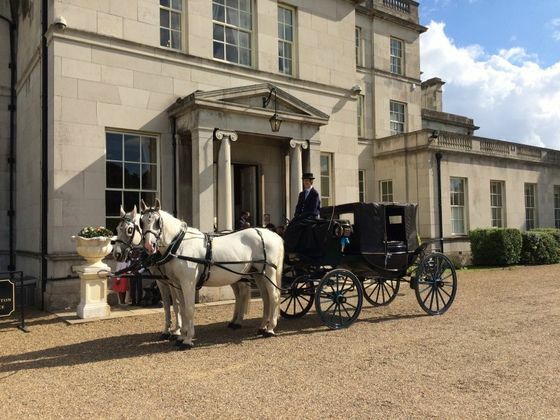 We have a number of carriages to choose from to meet the taste of the birthday person, and we offer a choice of two white (grey) horses or two black horses, and will decorate the carriage exactly how you want. From our stable yard in the heart of Kent, we’re able to provide our services throughout the South East of England. We’ll make sure that we’re at your destination to pick up the birthday boy or girl with plenty of time to take lots of pictures. Birthday horse and carriage hire is particularly popular with horse-mad children and adults, or children who dream of being a princess for the day. We often have people hiring our services for landmark birthdays, such as 10, 18, 21, 30, and 65. All of our horses are incredibly experienced and bombproof (not easily spooked), ensuring you a safe and enjoyable ride. Your wedding anniversary is a special event where you can show your spouse how much they mean to you. Here at Acorn Carriage Hire, our horse and carriage hire is one of the most popular anniversary ideas for people looking to ensure their spouse has an unforgettable day. With a range of carriages and horses to choose from, you can make sure that everything is perfect for this happy and exciting occasion. If you’re not sure where you’d like to go, our team will help you choose a romantic route for you to go on, and even stop at the pub for a drink and afternoon tea. Here at Acorn Carriage Hire, we’ll work closely with you to ensure your anniversary gift is perfect, dressing up the carriage in the ribbons and flowers of your choice. We will then meet you at a specified location and time, giving you plenty of time to enjoy your spouse’s surprise and take photos of their reaction. Our country rides can be at a location of your choice or from our farm on the North Downs. The choices are a country ride, a country ride with pub stop (drinks not included) or stop at a pub for afternoon tea. Drawing on many years’ experience, we help people realise their dream anniversary ideas and set up romantic carriage rides. From the initial call to the end of your carriage ride, we’re here to help you make your anniversary special. Get in touch with us, in Faversham, Kent, to learn more about our horse and carriage hire and rental.